Removing bats from your home can seem like a daunting task, and is one that is best left up to professionals. Having these critters in your home poses a variety of risks to both the wellbeing of your home and your family. Though vital to our ecosystem and protected by law in a number of areas, bats have no place inside a residence. The diseases they carry can be dangerous to both humans and pets, and even if they aren’t as active as some other animals often found in attics, the damage they cause through their waste should not be underestimated. The easiest way to tell if you have a bat problem in your home is to find evidence of their waste. Bat feces, or guano, is small, black, dry, and often found in piles underneath where the bats roost at night. It produces a high amount of dust, and easily crumbles if disturbed. 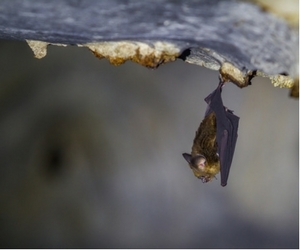 Wet spots are another indicator of bat activity. Finding wetness near entrances and exits to your attic often indicates their presence because they tend to empty their bowels as they enter or leave a building. At Critter Control® of Dallas, we understand the important role that bats play in our world, and we also recognize the need to remove them from your home. Our experts are well versed in all laws and regulations regarding bat removal, and are equipped with the best training and equipment available to ensure that every last bat is removed efficiently. Call us at 817-222-1101 with any questions, or to schedule a complimentary home consultation.